"If only people would stop swiping my copy of Roy Choi’s gritty biography from my desk, I would be able to go home and make one of his outstanding recipes, like his crazy-tender, delicious Korean-Style Short Ribs." F&W deputy food editor Kate Heddings names her favorite cookbooks of 2013. I love up-cycling food and it’s a movement that needs to spread far and wide. Here, Tara Duggan shows she’s a master, with clever recipes for things like beets and their greens, broccoli and its stalk, cauliflower and its core, and fennel and fronds, which form a base for her rustic, delicious fennel-braised pork. This book is an amazing reminder that simple food doesn’t have to be predictable and dull. 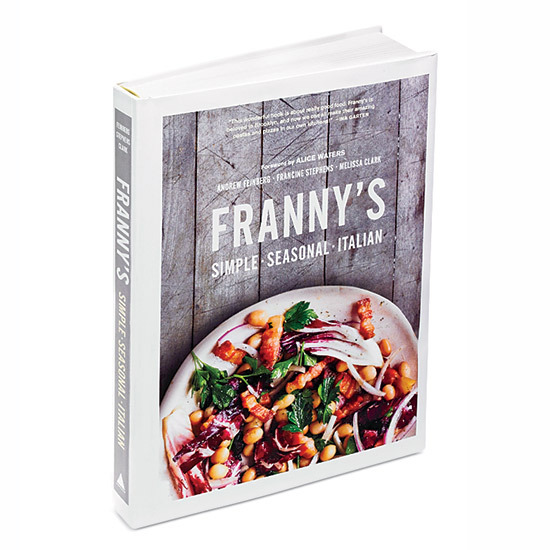 Franny’s, one of Brooklyn’s most beloved restaurants, embodies fresh, simple, seasonal and rustic dishes. One of the best pasta recipes we cooked all year was the Spaghetti with Artichokes—the artichokes nearly melt in your mouth. In my mind, any book about sweets has to draw you in with delicious-looking, mouthwatering images. Sweet completely won me over. I was pretty wild about most of the desserts in this book from the L.A. confectioner, but if I had to pick just one must-make dish, it would be the chocolate granola, a densely packed mix of oats, almonds, hazelnuts and cocoa nibs bathed in dark chocolate. I have no guilt eating this for breakfast. I always love this chef’s books. For starters, they are printed on gorgeous, thick paper, which always makes the images of his food look super appealing. But more importantly, Oliver’s food is consistently accessible and delicious. This book takes you through recipes from Spain, Italy, Sweden, Greece, France and Morocco. Cook anything from here the book and you’ll be pleased, but for starters, try his tangy, dill-heavy lamb fricassee. Attention, low-fuss cooks: This book has your name on it. Tanis, a former Chez Panisse chef, keeps it crazy-simple and crazy-good. For something healthy, warming and a little off the grid, try his Very Green Fish Stew, which is packed with herbs and flavored with grated coconut. It’s rare to get such an in-depth picture of the Tokyo ramen world, but Ivan Orkin takes his readers through the nitty-gritty, while also explaining how a Jewish guy from New York’s Long Island ended up with one of Tokyo’s most popular ramen joints. Orkin divulges his secrets for making great ramen as well as other totally delicious Japanese dishes, like Schmaltz-Fried Chicken Katsu (as he points out, why not fry chicken in its own fat?). Brilliant. Passing down many of the amazing things he learned from his mentors, chef John Besh’s book is part memoir, part cooking lesson. Besh journeys through France and Germany, teaching readers (with many step-by-step images) how to make everything from poached arctic char and classic pommes dauphine to blanquette de veau and pumpkin tian. It is always exciting when a beloved restaurant comes out with a cookbook but even more so when it’s a book you can actually use (and also lust over a bit). Kudos to Mike Anthony and the whole team on this book for creating something both beautiful and useful. I am bananas over the baked clams as well as the over-the-top chocolate bread pudding. Some cookbooks get dirty in the kitchen, others—like this book from the acclaimed California chef Daniel Patterson—live on the coffee table. With stunning images and lovely essays (as well as conversational recipes), Coi is both transporting and inspirational.